16 May - 20 September. 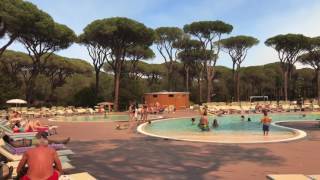 Cieloverde Camping Village lies in the heart of the Tuscan Maremma, between Marina di Grosseto and Principina, bordering the Maremma Natural Park. The huge site lies deep in a long established pine wood, looking out onto the Costa d’Argento, where a sandy beach slopes gently down to the sea. The 1,000 touring pitches (all around 100 sq.m) are in circular zones around sanitary blocks and all have 3A electricity and offer telephone connections. Parking is in designated areas away from the camping area. A wide range of entertainment is organised, including shows, dance events, open-air cinema and games. The site also offers a 2.8 km. Percorso Verde (Green Route) with 16 exercise areas. There is also a new adventure park, Tarzaland, where it is possible to explore the treetops thanks to a network of aerial walkways, ropes and swings. Surrounding the site is a large natural park where fallow deer, red deer, Moufflon sheep and other animals roam in freedom. 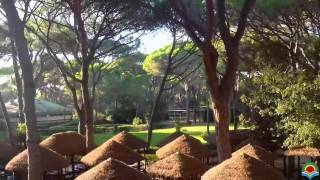 The site restaurant, takeaway and bars are centrally located and here you will find typical Maremma recipes, grills and other freshly caught fish dishes. Modern toilet blocks. Shops, café, restaurant and takeaway. Pizzeria. Bars. Hairdresser. Play area. Games room. Archery. Cinema. Chapel. Tarzaland adventure park. Transport to the beach. Dogs are not accepted in July/Aug. Internet access and WiFi. Site is west of Grosseto on the coast. Note: Grosseto has only one way of crossing the railway for anything other than cars. Follow Grosseto signs from S1 (the Aurelia) and cross town following road to Castliglione della Pescaia until you see signs for Marina di Grosseto. Site signed. This is the only way across town.